Summertime has a way of creeping up on us. School is suddenly out. Children are home. Days may now be wide open. Many children will be involved in summer programs for part of the time, but some will not. Summertime is often a lazy, relaxed time. But for a child with ADHD, a daily routine continues to be very important. During the school year, you are more likely to make your child adhere to regular bed, wake-up and meal times. This is important during the summer, as well. A schedule doesn’t have to be rigid, but days run much more smoothly when there are expectations and predictability for your child. Make sure the summer schedule includes lots of fun physical activities such as outdoor play (including lots of sunscreen), trips to the pool, walks in the neighborhood, bike riding in a safe area away from cars, etc. If your child likes arts and crafts, plan special projects over the summer. Visit your local craft store for ideas. You may even be able to identify a class that you and your child can enjoy together. Some stores offer free in-store demonstrations or “make and take it” activities. Talk with your child about what types of things he would like to plan for the summer. Perhaps he has been wanting to take a trip to the water park, learn how to skateboard or visit the new ice cream shop. Add your child’s ideas to the list. Don’t forget to allow time for unstructured, imaginative play for kids and quiet downtime for teens. To maintain academic skills over the summer, include daily reading times and study skills activities. Ask your child’s teacher if there is a workbook she recommends for your child’s age and academic level. The work shouldn’t be new material, but simply a review of skills learned over the past school year. Plan regular weekly trips to the library to stock up on books. Spend time reading together. Make this learning time relaxed, no pressure, just fun. Use a large calendar to write down daily activities. Include any camps, vacations, appointments, etc. If you have an older teen who is working, include his work schedule on the calendar. 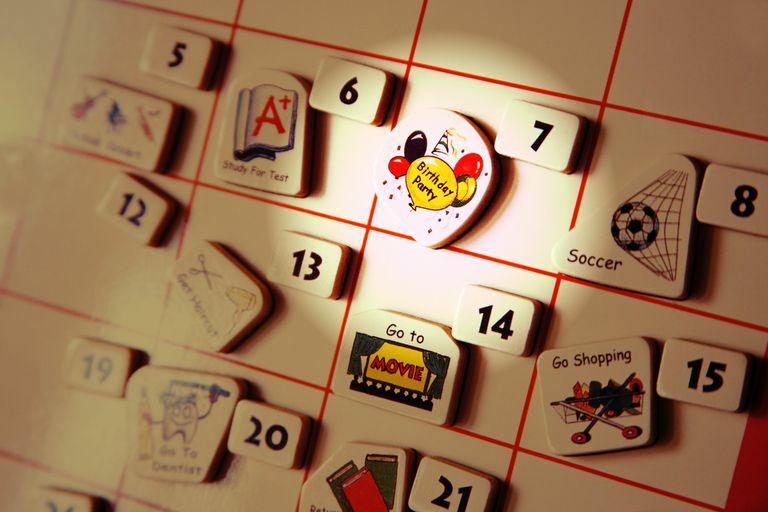 Post the calendar in a central location, such as the kitchen, so it is visible to the whole family. Involve your child in the planning. Review the next day’s schedule the night before. Use the calendar to prepare your child for upcoming scheduled activities such as swim lessons or the beginning of a day camp. Your child may even want to cross out the days on the calendar as he counts down to camp starting. You don’t have to schedule every minute of the day. The idea is to provide your child with a summer routine that is predictable, but flexible.